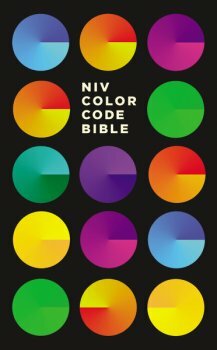 I received a lovely copy of the NIV Color Code Bible from Thomas Nelson Publishers. This is a gorgeous, sturdy, hardcover Bible aimed toward kids in order to teach them important key verses. Verses within each chapter are highlighted in different colors based on the topic the verse is about. Included topics are God, sin/evil, Jesus, new life, spiritual growth, prayer/praise, heaven, love, family/children, love, and animals. I feel like this would be really helpful for a kid reading the Bible through the first time. Like I said, this is just a gorgeous book. I love the colors on the cover, and there is a ribbon attached to mark your place. The pages are thin, as is typical for a Bible, but are a little bit thicker and stronger than in most Bibles (perfect for kids, who tend to be a little rough on things). I would recommend this Bible to a parent looking for their kid’s first real Bible. A good step up from children’s Bibles. *I received a free copy of this book from the publisher via BookLook Bloggers as part of their blogger review program. All opinions are my own. I was not required to write a positive review.